"I have just been informed that the wreckage has been found between Aguelhoc and Kidal," Mali's president, Ibrahim Boubacar Keita, said at a meeting of political, religious and civil society leaders in Bamako, reported Reuters. Aguelhoc and Kidal are located in a desert region in the north of the country. 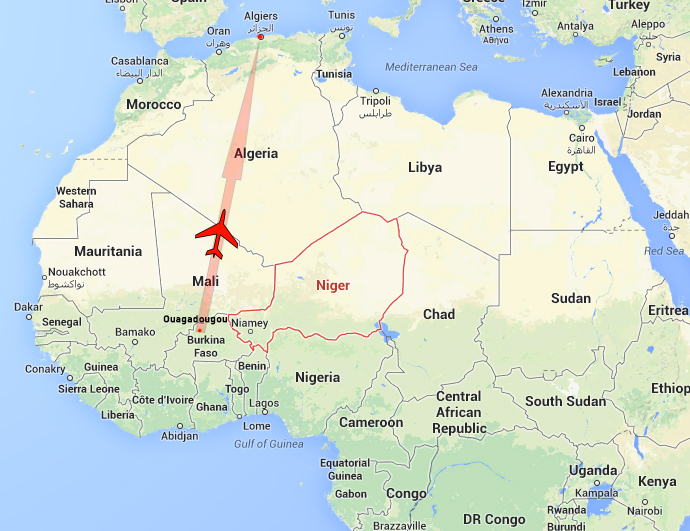 Air Algerie tweeted: FLASH Info: AH5017 the aircraft would be crashed to Tilemsi. The aircraft would be crashed in the region of Tilemsi, 70 km from Gao. FLASH INFOS : AH5017 : 50 Français a bord.